I don't talk price much in these product reviews. However, at under $40 including a lock and cable, this cover seems like a heck of a deal. VFR owners are a proud lot, and justifiably so. The do-it-all sportbike is a winner. This cover allows you to protect the Honda on the road from both the elements and wandering hands. The feature list is impressive to say the least. The cover is water resistant and breathable. The breathability is important to prevent condensation build-up. It boasts a chamois panel, which is stitched in where the cover would touch windscreen and fuel tank areas to prevent scratches. The lower panel is constructed of heat resistant "Thermoguard". 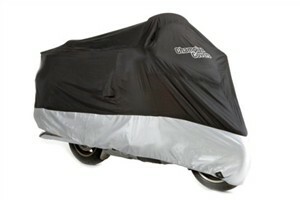 I don't know if I would place the cover over a blazing hot VFR exhaust, but this should hold up well to moderate heat. Reinforced poly-grommets are placed in the center and in the front wheel area for security and a snug fit. These grommets also accept the included cable lock. Since the fabric is "middleweight", this is the kind of cover that can be stowed on the bike for touring situations. With the features listed above, and when you take into consideration the fact that this package includes the lock and cable, you see that this is a truly remarkable deal. VFR riders rejoice!